It has been a wild week and may this communiqué update you’all with great refreshment in the Holy Spirit! My morale is so pumped up and the river of God is so strongly flowing in my belly in this late hour to serve you’all and do whatever we can to help you become overcomers per Revelation 21:7. We no longer live for ourselves but for you’all as this is our new life expression since encountering the desert wasteland glory realm of Gethsemane! We exist to service your faith and there is no other desire so grand! So how can we serve you’all with a fresh new move of the Holy Spirit? Well the first way is to get you under the spout where the glory is coming out…and that location in Heavens GPS scheme of things is Israel and the coming awakening here. The glory of God is moving in these last days apocalyptic grand finale towards a great visitation upon the currently blinded Jewish people and you and I have been given the great privilege to be involved in a ground floor opportunity of unprecedented fruit production for the Master! All of us believe in the promise of Genesis 12:3 and desire to experience the overflow of those blessings in our lives. And I believe that we have found the most profound way you can bless the natural seed of Abraham anywhere on planet earth! It is thru these special operations He has given you and I an unprecedented way to bless and comfort His ancient people! Most of our operations with the IDF warriors these last three years has been shrouded in stealth secrecy due to the security restrictions placed upon us. However, what I’m about to share with you’all is one of the little side operations we have found ourselves windwardly blown into by the Holy Spirit that has recently produced great fruit. It continues to amaze us how great a fisherman the Holy Spirit is if we will just yield and serve people here and not let our brain tissue default us into the paralysis of analysis of what we think “will work and not work”, in fishing for men in this tough neighborhood! So what I’m about to share with some of you’all may cause a religious knee jerk response of disbelief or varying opinions of criticism to flow, but what we cannot deny is the tremendous fruit being borne for the Master thru this latest small excursion away from the traditional ways all of us usually conduct local outreach events! OK, let’s now go outside the box and explore one of these new ways we have been reaching the Israeli Night Warriors here…. As many of you remember from last July 2009, I was strategically placed by the Holy Spirit into the 18th Olympic Maccabiah Games and won a silver medal in the Cycling Time Trial Championship race with absolutely no background whatsoever in this difficult sport (see link). After these Olympic games were over, unbeknownst to me, my name was being floated around the Israeli sports community as one of the upcoming new athletes in long distance events. Now those who know me know that I’m in no way interested in sports or competition events, as I would much rather be conducting revival meetings, casting out devils, and doing shofar drive-by’s against the underworld. But what Dalit and I recognized in the community of IDF special forces was this fierce desire among these incredible warriors to keep fit thru this new avenue of endurance sports (i.e. cycling, Ironman, etc…). This fascination with extreme endurance sports is what fits perfectly into their ethnos of the Israeli mindset of overcoming and winning when one is facing overwhelming odds. So a few months ago I was invited to join a new professional Ironman team here even though I had never done one or even much less cared to do a intense long distance Ironman race! This professional team was made up of IDF officers from many different special units and the training classes as well as the training camps were fashioned to mirror that hard and rugged discipline of the Israeli special forces. Being the oldest person on this team, I suffered greatly trying to keep up with all these young bucks and for the first few weeks I felt like I was being run over by a Mack truck repeatedly (LOL). It was crazy in the natural…but God was so in this thing as this professional group was just dumbfounded to see how fast I would recover and excel even faster in my interval sessions than most of them. The coach of this team would make comments of how I was becoming an “aerobic monster” and that if I would keep it up I could qualify for the World Championships. I would always respond that I was not interested in the World Championships and just wanted to serve them and see them (not myself) reach their athletic potentials. This attitude was blowing their minds, as we were to found out, because many here do not know how to respond to acts of kindness and thus many on the team have since become very endeared to us these last few months. I remember that it was during one of these crazy early morning endurance camps last Spring that I was finally accepted into their “fraternity” of warriors even though I have no special forces or military background. The hand of God was moving and I was granted unprecedented favor to become a part of again another Israeli special forces community and its mysterious IDF ethnos. We are literally become all things to all men that we might save some (I Cor. 9:19-27)! (And all of this was transpiring while the other stealth operations we were doing with the other special units was still going on). My mind was spinning at all the open doors and the huge network that was opening to us on so many different fronts these last few months, and it was like I was multitasking so many huge programs all at once! I knew Abba had called us to Israel for a special work…but in no way had I ever envisioned so many different doors opening simultaneously to us for new fishing adventures galore! Glory to God! 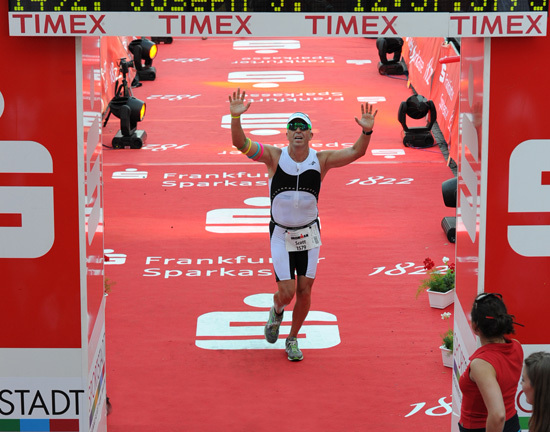 The culmination of all this early morning endurance training happened this last weekend on July 4th, 2010 in Frankfurt, Germany whereas Dalit and I traveled with this professional Israeli team to the Ironman European Championship. 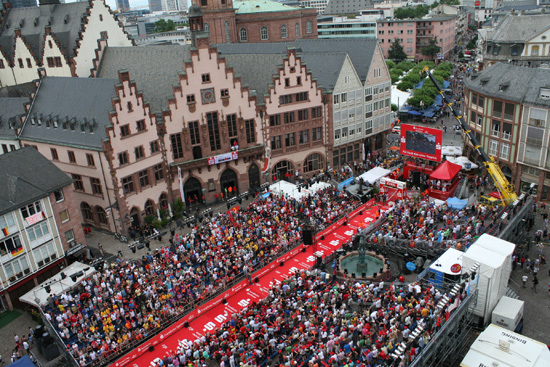 The atmosphere of this Ironman event was just incredible with hundreds of thousands of German spectators cheering us on. On race day I had a Israeli flag painted to my right shoulder as a sign of not only the new friendship Germany has with the State of Israel, but also as a sign of how we were being killed here by the Nazi’s 65 years ago, but now we were back from the ashes of the Holocaust as a people due to God’s unbreakable covenant! Most of the Germans loved us but there was a few that would call out a anti-Semitic remark when I flew past them on the 185 kilometer bike course. But for the most part it was a very lively celebrative atmosphere especially with 24 hours earlier the German national team powerfully defeated Argentina in the World Cup quarterfinals. 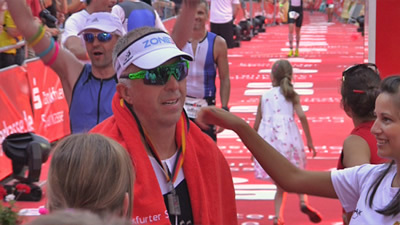 The results of the Ironman Germany European Championship for our Israeli team was awesome, yet for me it seemed to a huge let down. 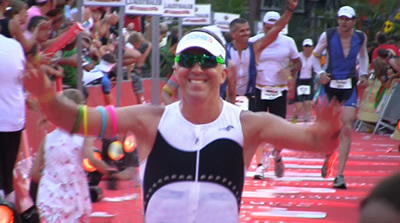 The great witness to the Ironman sporting world was that two new Israeli athletes hammered out amazing course times and secured slots to attend the Ironman World Championship in Kona, Hawaii. Gilad Rotem (special Sayeret officer and now medical student) scorched the course as a amateur with professional results! And one of our dear friends Nina Pekerman (a Jewish immigrant from Moldavia), also set a record as a amateur finishing in the top ten of the professional women overall! They both are very incredible and gifted athletes and are going to put Israel on the map in the Ironman scene for years to come! We are thrilled to see these two represent Israel in such a new surprising way! So what happened with me? Well, it is amazing how God can use a seemingly defeat into such a great testimony for His glory! 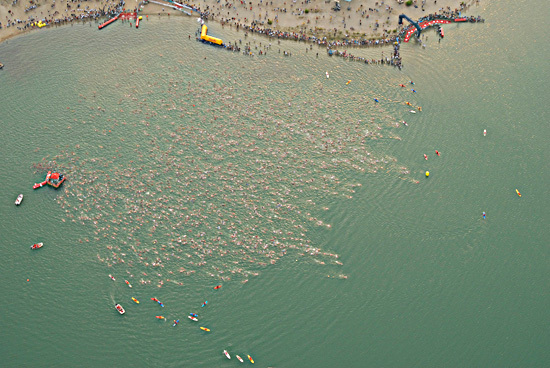 My race started out awesome with a fast 3.8 kilometer swim. 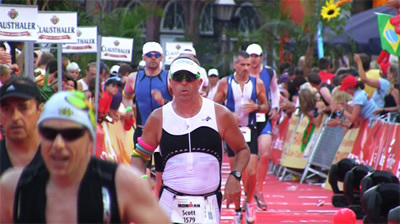 I came out of the water in the top 10% of over 2000 athletes and hit the bike course with a fast transition. However, 50 kilometers into the 185 kilometer course my front handlebar bracket snapped off and I almost crashed into a German country villa! After getting myself back on the bike course, I noticed that my bike was incapable of getting above 35k per hour so I was left to just trying to survive the long ride and get back into downtown Frankfurt and the running section of the course. Upon arriving back into the transition area I noticed I had either eaten bad gels or forgotten to keep hydrated and began to have severe nausea and dizzy spells. Once on the first kilometer of the marathon run I decided to check myself into the hospital tent for emergency observation and the medical staff began to check out my vital signs and I was immobilized on a stretcher. Everything within me was seemingly telling me to call it a day and just go to sleep…however, at this my greatest moment of pain, weakness, and disappointment I heard the still small voice of the Holy Spirit telling me to get up and finish the race! I knew it was the supernatural secret place to victory and healing coming to me like a gentle fall breeze rustling thru the leaves. So I did everything I could to get up off that hospital tent stretcher and put my Ironman uniform back on! The Doctor and medical staff looked so stunned and asked where I was going…I smiled and said, it is time to finish this 42.2 Kilometer Marathon! I struggled greatly to get out of that tent but as soon as my feet hit the running course I felt the Holy Ghost take over and His supernatural energy pulsed thru my weakened tabernacle! And finally at 12 hours and 58 minutes I was able to cross the finish line in tears of joy to see Dalit and the other Israeli warriors waiting to embrace and hug me for not giving up (see video link below). Now what has transpired from this unexpected slow race time in the natural has now blossomed into a great testimony to the Israeli warriors who know us. It is not winning the race or doing well with few circumstantial difficulties that has interested these IDF warriors we know. What has gripped their conversations and curiosity is how in the world did I get up from the hospital tent and finish the Marathon!? It is unheard of!!! Here is some of the emails and messages I have received the last 48 hours from these IDF warriors. “Shlomo, you are a true warrior!” “WOW, amazing! How did you get up and finish the marathon? What power is in you?” “Shlomo the Great”! “There is power in your legs not heard of before”! “Tell me how did you do it? What is in your mind that caused you to get out of the hospital bed”? “Absolute brilliance! Courageous”! 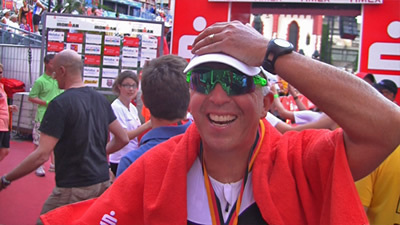 And from one of the champions they said, “Shlomo, I’m not at Ironman today…you are the true Ironman”! Now please understand I’m not listing these reports to lift myself up in any way, shape, or form. I’m very content in remaining unknown and living in the motif of the scum of the earth message (link). But what I have finally realized is that the best fishing lure we have to break thru the stubborn rebellion and unbelief of the Israeli ethnos here is not to display only a theory of overcoming from the Scriptures, but to live before them a real example of overcoming in a real time Scriptural event of miraculous power that stuns and opens up the Israeli warrior here to the message of the Good News! It is the overcoming mixed in with them seeing the trials and suffering I went thru that opens up the hardened Israeli to the secret power of the Cross within us who believe! Glory to God!!! For when we are weak then we are strong (II Cor. 12:7-12)! So that is a quick summary of another exciting weekend here at Rivers in the Desert and it is good to be back home in Eretz Israel and getting my shofar ready for some more drive-by’s against the underworld and the terrors of the night! 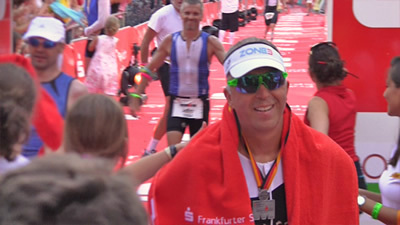 We also have worded hard the last 48 hours to put together a inspiring video of this Ironman Germany event and scroll below for the link! Keep in touch and may this testimony encourage you in the fight of faith you maybe waging in your sectors of responsibility! Brother Scott, Your fierce devotion to the Gethsemane lifestyle continues to motivate and encourage those of us who wish to live as true bondservants to Jesus Christ our Messiah! Lifting you up in prayer is a priviledge. Keep up the great work. Congratulations, Scott, for finishing the marathon. You are an inspiration. Scott congrats and thank you so much for this good news. Its very encouraging to read some positive witnessing grafted within your race, praise God! I have been receiving some horrible rhetoric emails from others; one regarding the doom and gloom of ‘Urgent Prayer Alert for Israel’. May the Lord will bless you, your family and the IDF warriors; that He keep y’all in His loving light forever. Again thank you for sharing. WOW!!! God has used this story to incorage me in the tasks He has set before me. This past week I had what may seem to be a major attack to get me to quit. I was able to look to Jesus and sluff it off.. keep on trecking… keep on going after Him. Thank you for sharing. What a most glorious lesson learned! As we overcome in great difficulties The Glory of God shines ! Hallelujah! That is very encouraging and inspiring. We can do ALL things through Christ who strengthens us. God bless you Sir. Major Congratulations on your performance in Germany! I’d love to be over there with you in your work. I’m realizing more and more how important it is in the bigger picture. If at all possible, when you’re in the states, please come to Seattle. I’d love to see you speak in person. Seattle could sure use some of what you have. I hope to be of greater help to your ministry. Have to get over some serious financial humps in the meantime. Tons of blessings to you in the interim and stay safe.